Product code: ES7140 Categories: Antique, Antique Brooch. 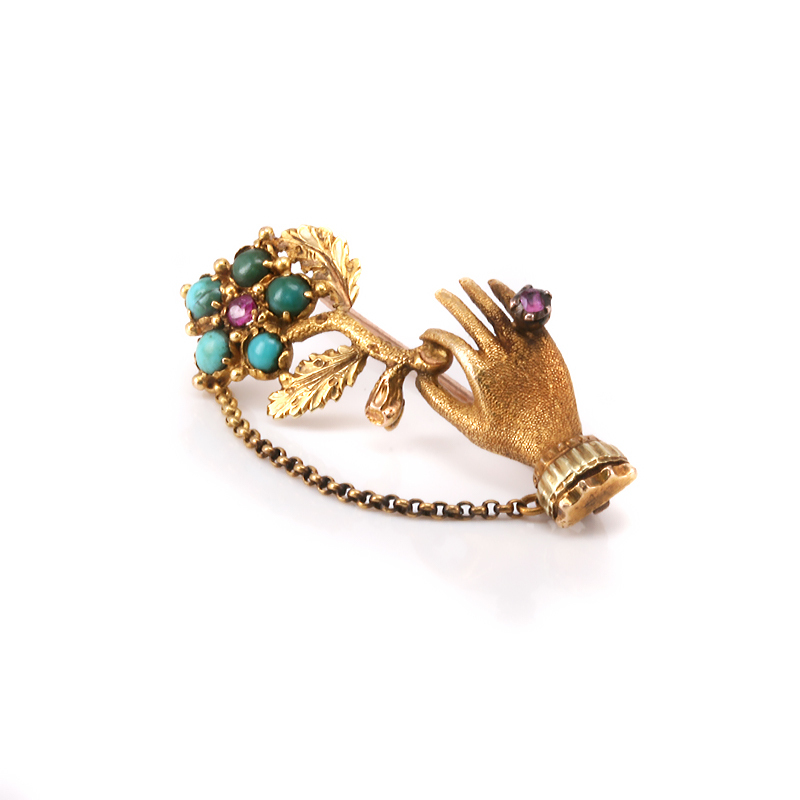 The mid-Victorian era of the 1850’s is affectionately known as the “Romantic Period” where gifts were given that represented love and romance, and here is a very romantic antique brooch of a hand holding flowers dating from around 1855. So called the Romantic Period as this was when Queen Victoria was married to Prince Albert, and as Queen Victoria was widely popular and influential in fashion and jewellery styles, this carried onto what people were wearing including brooches such as this one. Exquisitely hand made in 18ct gold, the brooch is of a hand holding a flower. Flowers held such a sentiment of love and romance and this flower is set with turquoise surrounding a ruby and even the hand that is delicately poised holding the flower, is also set with a ruby on the end finger. Measuring 34.9mm by 17.1mm this brooch will sit so well on any outfit and is destined to be appreciated for its beauty and style. This is such a charming antique brooch that well over 160 years old, is as beautiful today as when it was made.